Here is a Visual Fusion sourced timeline of earthquake events over the past decade. In this arrangement, two questions come to mind right away..
What's up with the months of March 2011 and March 2010? Were there any relatively peaceful eras, given earthquake frequency and intensity? First a word on the Armchair Intensity Rating. It's a hack and should inspire spit takes from geologists. Since you are not a geologist (I lost them once sentence ago) you might agree that given the data at hand (Magnitude and Depth), a non-linear combination of those will serve as a reasonable proxy for less comprehensible and more accurate measures of intensity, since shallower quakes of the same magnitude are felt more violently than deep ones. Magnitude is a non-linear scale (a mag 7 is ten times more maggier than a mag 6...), so squaring that and dividing it by the diminishing impact of shallowness (depth squared) serves as a stand-in for assumed quake intensity. 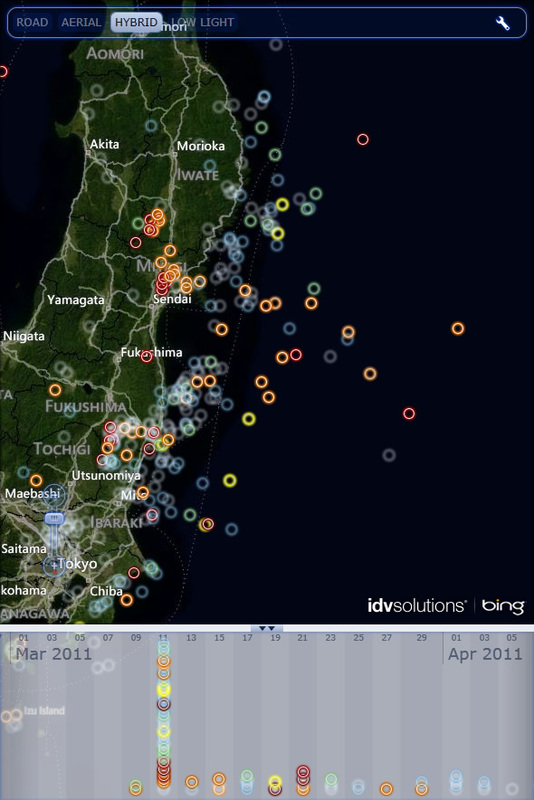 2011 and 2010 saw noticeable spikes in earthquake activity -many times that of typical months. Turns out both of these spikes are associated with Earthquake Swarms. The 2011 swarm focused around the Tōhoku earthquake and resulting tsunami tragedy around Fukushima. 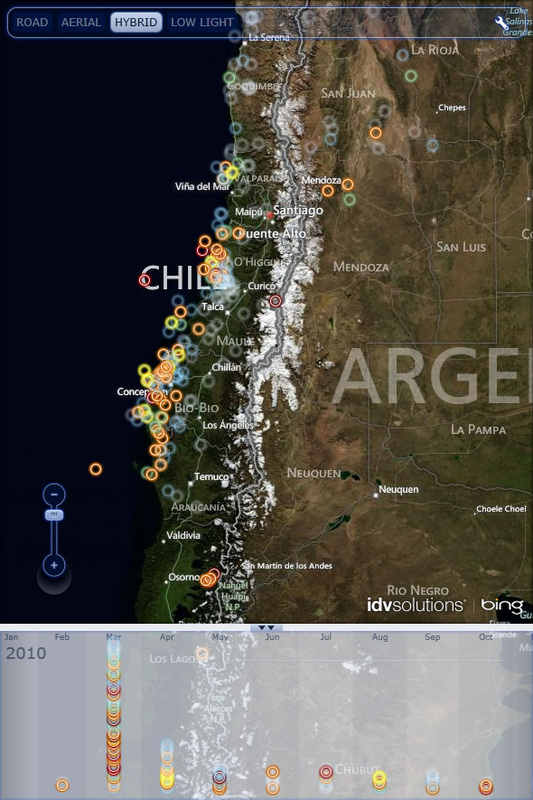 The cluster of earthquakes around the Chilean coast in March of 2010 were relatives of the Chile Earthquake of 2010, which actually happened at the tail end of February and reverberated for some weeks. Other months throughout the decade, by contrast, are relatively tame -April of 2004, for example. Almost no quakes, and not very intense at that. Interestingly, the strain of tidal forces have been shown to be correlated with tremors. Adding a feed of local tidal peaks would be a really nice comparative dimension to layer in. Maybe later. I think that visualizing data is really important, especially outside one's own discipline. Who knows what you might discover? Kudos on your earthquake map and tornado maps. They're spectacular.